Definitely LAANAT hee hay aap par, I thought u were a “danishwur”. You are a typical small hearted impatient aunty!! 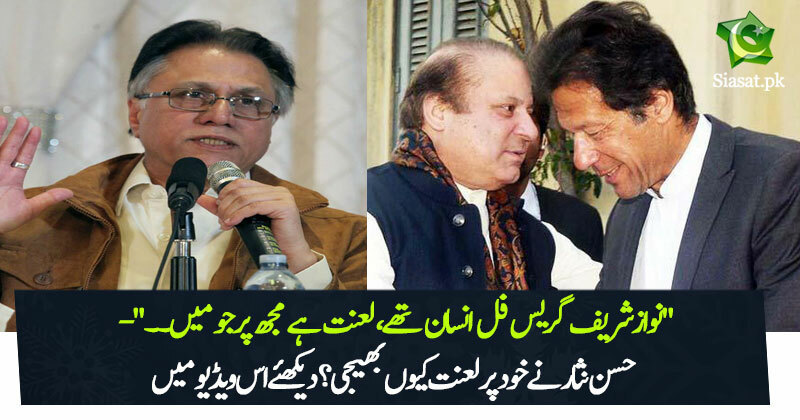 Couldn't believe that was Hasan Nisar, he probably had one too many to drink. Yeah itni purani laanat aaj phir kyu market mein aa gai ? Video dekhne se pehlay ye zehn-nasheen Ker lein ke ye aaj bhi GEO per baith ker programme kerta hai. What sort of analyst he is? He could not analyse debt ridden economy's after effects? His self lynching can be justified only to that extent. Haha hangama hay kion barpa thori si jo pi li hay? Sami Ibrahim, Irshad Bhatti and Arif Hamid Bhatti are next in line to expose themselves. They gained their popularity on the shoulders of IK, otherwise who would have been watching them??? جس قرضے کی قسط کی بات کر رہے ہو وہ اسی نواز شریف کا لیا ہوا جس کو آپ اعلیٰ طرف کہہ رہے ہو. کوئی بات نہیں حسن نثار، یہ وقت بھی گزر جائے گا. انشاءاللہ. انصافی بھائی کسی کو بھی گالی دینے سے گریز کریں. اس میں کوئی شک نہیں کہ حسن نثار اور رؤف کلاسرا جیسے صحافیوں نے انتہائی مشکل وقت میں پاکستان تحریک انصاف کا ساتھ دیا تھا. He meant to say Nawaz was saviour of blackmailer media and used to pour billions from Tax Payer money as a bribe to hide his sins and wrong doings. Who would be watching these channels and their useless talkshows if only PPP & PML-N were duking it out in the political arena??? They have to thank IK/PTI for spicing up the dull politics and earning potential of worthless "Senior" Anchors/Analysts!! !